You are here: HomenextTransportnextTransport - shipsnextCHAKLA in Tilbury. 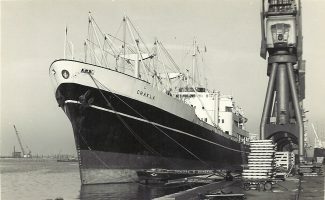 The British India ship CHAKLA in Tilbury. Note that Tilbury Containers ( TCS) was not yet built. 1970 ish. She was built in 1954 and was sold to Singapore owners in 1972 as the GOLDEN BEAR.